Halloween is upon us, and, rather than trick-or-treating, carving out pumpkins or apple bobbing, you may be looking to find the best horror games on Nintendo Switch to scare you silly. We have rounded up our favourites, whether they are survival horror, horror-themed or simply unsettling, to hopefully give you some pointers on what’s best to buy on the Nintendo eShop. Bulb Boy is a game that, put simply, is about a boy that has a glowing head. After waking from a frightening nightmare to discover an evil has overshadowed the Bulbhouse, he must summon up enough courage to overcome the darkness and restore light to save everything that he loves. In this quirky 2D point-and-click horror adventure, you will unscrew Bulb Boy’s head to solve puzzles by placing it in increasingly strange places. Bathed in a neon green glow, it’s a short but memorable experience on the Nintendo eShop. Dark Souls Remastered delivers a more punishing experience than it is horrifying, but, thanks to the constant threat of losing the souls that you have accumulated, makes for an edge of your seat ride like no other. The ghoulish monsters and nightmarish bosses that you encounter make Lordran a harrowing place to exist in, and, whether you’re facing the Asylum Demon for the first time, fleeing from Ceaseless Discharge or staring at the somewhat off-putting Gaping Dragon, their monstrous designs make it the perfect world to spend Halloween in. Detention is a 2D side-scrolling horror game that delivers a spine-chilling atmosphere. Set in Greenwood High School that, for whatever reason, has been built in a remote mountainous area, two students find themselves trapped inside and must make their escape. With hostile supernatural events starting to occur at the school, it has become haunted by evil creatures that will see the students be challenged to overcome puzzles as they flee to safety and uncover the story behind what has happened. The spiritual successor to Playdead’s LIMBO, INSIDE is a puzzle-platformer in which, after escaping capture, an unnamed boy stumbles into increasingly strange experiments. It’s a hard game to explain, but, if you’re looking for an experience that’s wrapped up in mystery and riddled with intrigue, you’re sure to enjoy this. And, talk about what happens to your friends afterwards. In this psychological and psychedelic horror game, you unravel the story about a painter’s descent into madness as he looked to create a masterpiece. You will have the chance to learn the dark story about his past, but Layer of Fear: Legacy’s most unsettling moments come from how the mansion that you are in constant changes as you move the first-person camera around. After waking in the middle of a forest on the edge of hell, a young boy starts searching for his missing sister. Thanks to its haunting black-and-white art direction, LIMBO is an eerie game to play that, for most, will see you die multiple times as you try to overcome the platforming puzzles that cross your path. You must beware what lies in the shadows, as you see this award-winning game through to its conclusion. In this dark tale, you will be confronted with your childhood fears. You must help Six escape The Maw, a large vessel on which corrupted souls long for their next meal. Which, if you aren’t careful, could be you. Extending your play session, Little Nightmares: Complete Edition also contains the Secrets of The Maw expansion. This lets you experience a parallel escape story where you play as the Runaway Kid, who will explore hidden areas on The Maw that lend a different perspective to what you witness in Six’s adventure. Now, Night in the Woods isn’t your typical horror game. But, thanks to the many twists and somewhat darker turns that the story takes, it’s still a great pick for Halloween and one of the best experiences that we’ve had on Nintendo Switch. As engrossing as it is intriguing, you play as Mae Borowski who returns home after dropping out from college. Possum Springs isn’t the thriving mining town that it once was, and, lending an air of mystery to the adventure, strange things are happening at night. And there’s something in the woods. If you don’t believe that games can make you jump, then let Outlast: Bundle of Terror prove you wrong. As independent journalist Miles Upshur, you break into the recently re-opened Mount Massive Asylum as you look to uncover what the Murkoff Corporation is up to. Expect to nervously peer around every corner as you descend deeper into the facility, and frequently yelp in fear. With no ability to fight back, you’re only chance to survive any of the asylum’s terrifying inmates is to run for your life. If you have already played Outlast: Bundle of Terror, then Red Barrels has served up an equally harrowing sequel. In Outlast 2 you play as an investigative journalist and cameraman, Blake Langermann, who, working with his wife Lynn, have traced clues about a pregnant woman’s murder into the Arizona desert. It promises another twisted journey that will lead you to Temple Gate, a town hidden from civilisation where a cult is preparing for the end of times. And, you become caught in the middle of it. This supernatural thriller is eerily unsettling. When a group of friends travel to Edwards Island for an overnight party, they unwittingly open a ghostly rift. This link to the old military island’s cryptic past starts to affect the passage of time, and, as you work out how to overcome each situation, the choices that you make will impact your friend’s lives. It’s easily one of the most captivating games that’s to be found on the Nintendo eShop. Any list of horror games wouldn’t be complete without a Resident Evil game, and, on Nintendo Switch, there are two at the moment. Resident Evil Revelations is a game that I had first played on Nintendo 3DS, and, thanks to Capcom’s HD remaster, it’s now on the portable home console. Taking place between Resident Evil 4 and Resident Evil 5, it stars series favourites Jill Valentine and Chris Redfield as they work to uncover the truth about the T-Abyss virus. Whether aboard a supposedly abandoned cruise ship or the devastated city of Terragrigia, horror lurks around every corner and, with limited weapons and ammo available to you, the experience is remarkably tense. 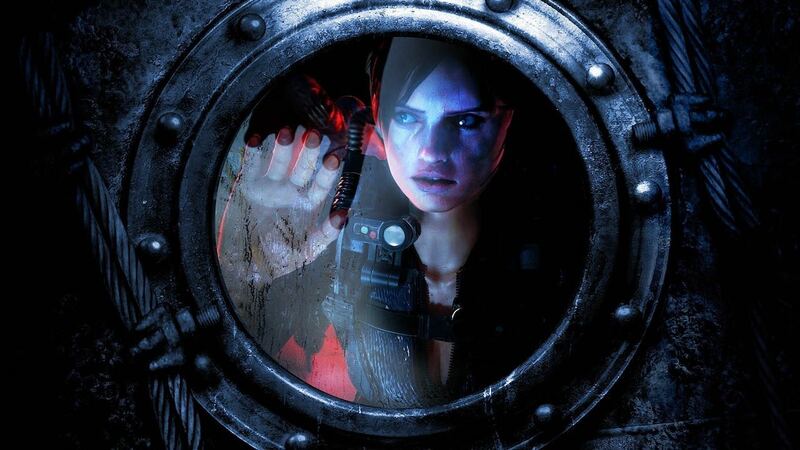 You could also choose to play Resident Evil Revelations 2, in which Claire Redfield makes a return working for the anti-bioterrorism organisation, Terra Save. When armed forces storm the office, Claire and Moira Burton are knocked unconscious and wake to find themselves in an abandoned detention facility. They must work together to work out who took them, and for what reason. You play as Youngho in this South Korean survival horror game, a student who, after falling asleep in his final exam, wakes up to find himself trapped in a twisted version of his school. He’s not alone, either. Now relentlessly pursued by a psychotic criminal, he must keep himself out of sight while working out how to make his escape from the school. With The Walking Dead: The Final Season lacking the concluding episodes due to the sad circumstances that have surrounded Telltale Games, it leaves the award-winning The Walking Dead: The Complete First Season as your best choice if you’re looking for a story-driven experience. There are five episodes to play through, as well as the special episode 400 Days, in which you will witness how convicted criminal Lee Everett and an orphaned girl called Clementine survive in a world that has been ravaged by the undead.